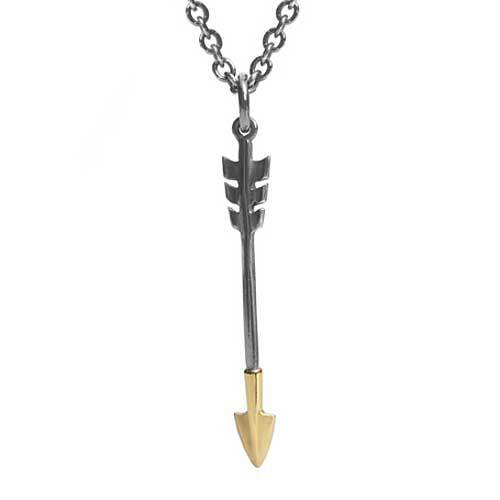 Gold & Silver Arrow Necklace: LOVE2HAVE in the UK! Here we have a silver arrow necklace made entirely of solid sterling silver in beautiful intricate detail complete with tail feathers and pointed nose tip. The silver comes with an oxidised finish, and for that extra unique appeal, the arrow has a gold vermeil tip giving this piece superb colour contrast. Arrows are not only synonymous with Red Indians and Medieval times too, but also convey a spiritual output. Most famously of all is Cupid's arrow signifying love. Its slender design is securely held by an eyelet as it dangles vertically threaded onto an oxidised silver chain which as standard comes in at 18 inches in length.